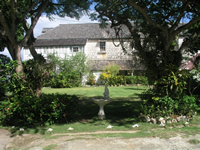 Built between 1780 and 1800, the Greenwood Great House contains perhaps the finest example of antiques in the Montego Bay area. Owners Bob and Ann Betton go out of their way to explain the antique furniture, oil paintings, and musical instruments to their guests. Connected to the famous family of Elizabeth Barrett Browning, the house also features an extensive library of rare books.